One of the best family meal formats around? The mighty casserole! And while some of the oven-baked creations are bogged down with heavy ingredients, these healthy 'n hearty casseroles have under 350 calories per serving. Dig in! Place cauliflower in a large microwave-safe bowl; cover and microwave for 3 minutes. Uncover and stir. Re-cover and microwave until hot, about 2 minutes. Drain excess liquid. Roughly chop cauliflower, return to the bowl, and cover to keep warm. In a medium-large pot, cook pasta per package instructions, about 6 minutes. Meanwhile, chop half of the turkey pepperoni. Drain pasta, and stir into cauliflower. Cover to keep warm. In a medium microwave-safe bowl, combine crushed tomatoes, cream cheese, cheddar cheese, sour cream, and seasonings. Mix well. Microwave for 1 minute, or until cheeses have melted. Stir until mostly smooth. Add cheese mixture to the pasta and cauliflower. Stir to coat. Mix in chopped pepperoni. Transfer contents to the baking pan. Top with Parm and remaining pepperoni slices. Bake until entire dish is hot and bubbly, 20 - 22 minutes. Hungry for More Healthy Family-Friendly Casseroles? It's National Seafood Bisque Day, October 19th. Forget creamy seafood soup: This seafood stew is SO satisfying! 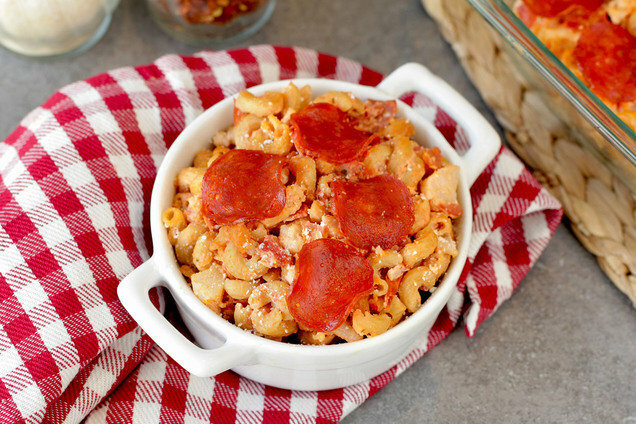 Make sure all your buddies have these go-to casseroles! Click "Send to a Friend" now.